Good Monday morning and welcome back. While the bears contend that the market is ripe for a spill, so far at least, sideways appears to be the new down. For example, the S&P 500 has been moving sideways since mid-February and closed Friday just 1.68% off the March 1 all-time high. However, with questions about the Fed's next move, valuations at lofty levels, and some of my favorite long-term indicators waving yellow flags, some caution appears to be warranted. My apologies for sounding like a broken record here, but keep in mind that weakness in the indicators is often a precursor to meaningful corrections. Yet, at the same time, it is important to note that these types of warning signs can often be very early. With stocks having moved sideways since mid-February and the 5-, 10-, 18-, and 39-day smoothings all within 2 points of each other at the present time, this is the definition of neutral. 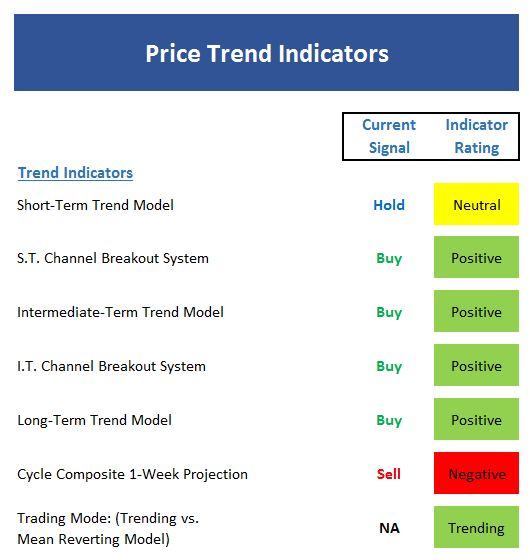 The intermediate-term Trend Model has technically moved to the negative zone. A "lower low" on the weekly chart would confirm a negative trend. The intermediate-term Channel Breakout System also remains on a buy signal. A close below 2322 would trigger a sell signal. Our Trading Mode models are currently conflicted, which suggests the market is on the cusp of returning to a mean-reverting mode. Our short-term Trend and Breadth Confirm model is currently neutral. However, stocks tend to advance at a decent clip in this mode. Our intermediate-term Trend and Breadth Confirm has slipped to negative. Albeit by the smallest of margins. 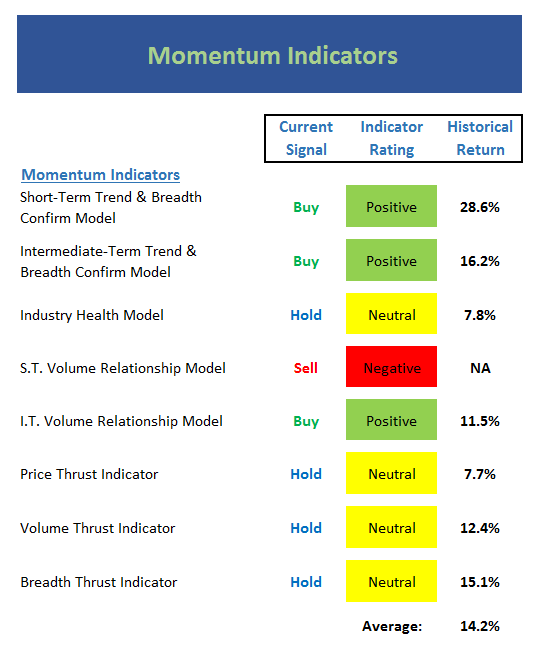 No change in our Industry Health Model as the reading remains in the middle of the neutral range. The short-term Volume Relationship remains negative and is heading in the wrong direction. The intermediate-term Volume Relationship model is positive but the trend of both Demand and Supply Volume are testing important technical levels. 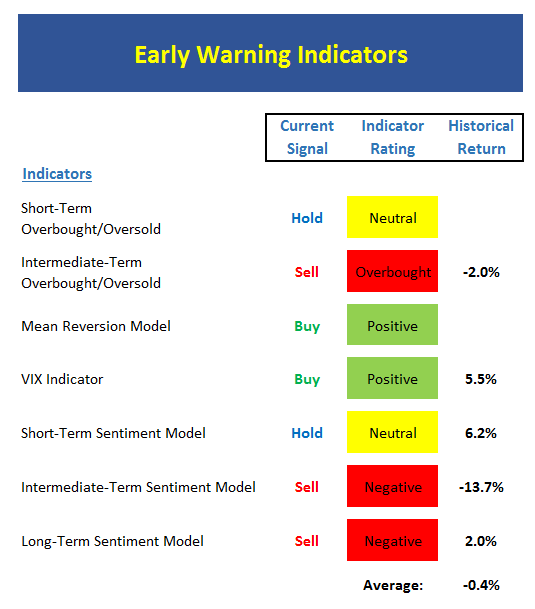 The market has worked off the recent extreme overbought condition and is now rated neutral. However, note that stocks tend to advance at an above average rate in this mode. The Inflation Model is still negative, but is currently flirting with the neutral zone. Our Relative Valuation Model continues to weaken as earnings are not rising to the level that rates have risen. 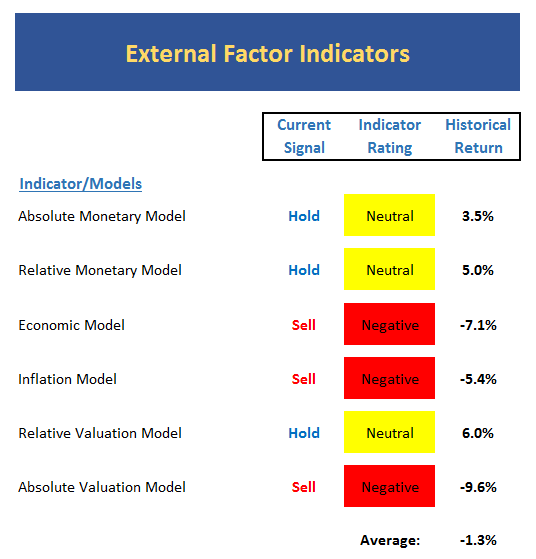 Overall, the External Factors board continues to suggest that risk is elevated and some caution is warranted. 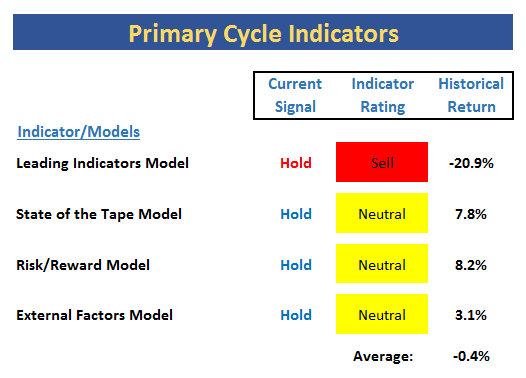 The Leading Indicators model, which did a fine job during the last bear phase remains on a sell signal. This is disconcerting. From a purely price trend perspective, it is clear that the stock market is stuck in neutral at this time. This is confirmed by our momentum board. And unfortunately for the bulls, the early warning board does not sport a lot of green at the present time. In addition, our bigger-picture and external factor boards are not encouraging. Thus, the primary message from this week's review is that risk is elevated and caution remains warranted. Publishing Note: I am traveling the rest of the week. Thus, reports will be published as my schedule permits.